Spacious apartment, plenty of seating, kitchen well stocked, washing machine, dishwasher and good sized fridge freezer. front of apt gets plenty of sunshine. beds comfortable with plenty of towels etc. Wi Fi excellent. Across the road a good promenade and the beach and bikes for hire. Plenty of shops and bars about a 5 minute walk away. Parking a bit tight but essential. The place is pretty large and the view on the see is awesome. Vincent, our host, was really nice and helpful. The communication was perfect, the place is well situated, if you have a car, and there is a parking lot in the front of the building. We received an excellent service from the property managers and they were very accommodating. Nuria was great at managing to booking and communicating. She responded quickly to my enquiries. Vincente was super and we really appreciated his understanding towards our very inconvenient arrival time. The apartment is huge and bright, and has everything you need for a family stay...and more if you choose 'self-catering'. Beds were comfortable, plenty of space and hangers for clothing and the view across the road to the beach is great. In a great location with plenty of bars and restaurants serving excellent food! Around 15 minutes walk from the centre of Malaga, which is truly a beautiful and interesting City. Het appartement ligt heel dicht bij het strand en heeft een prachtig uitzicht. We werden vriendelijk ontvangen, bijna alles wat we nodig hadden was aanwezig. Singurul lucru pentru care merita inchiriata aceasta locatie este privelistea catre mare. 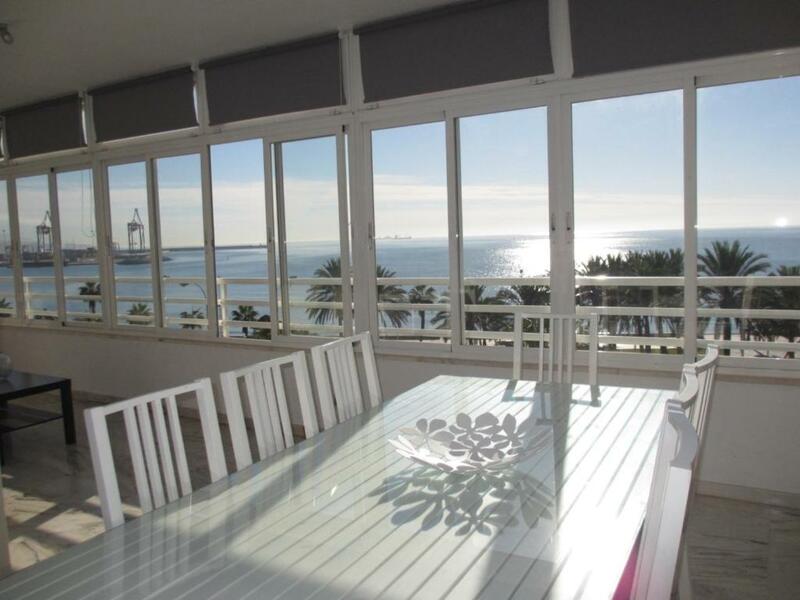 Located 550 feet from the beach, this apartment features free WiFi and a terrace. The property features views of the sea and is 1.6 mi from Calle Larios. There is a dining area and a kitchen complete with a dishwasher, an oven and microwave. All rooms have air-conditioning. Towels and bed linen are offered in this apartment. Malaga Cathedral is 1.6 mi from Rentcostadelsol Malagueta-Pacifico, while Carmen Thyssen Museum is 1.6 mi from the property. The nearest airport is Malaga Airport, 3.7 mi from Rentcostadelsol Malagueta-Pacifico. When would you like to stay at Frenta a la playa Malaga-Antonio Machado? This air-conditioned apartment has sea view, a washing machine and electric kettle. It is a spacious apartment in beachfront area Huelin, in the city center and only 1.8 meters Muelleuno, Port of Malaga. It has very comfortable with good beds and sofas. It features Air conditioning only in the living-room and in each bedroom, and wireless high speed. In this apartment you can find everything you need to provide a good rest and a step away from the city. I am a serius person that we try to help to guess what they need. Huelin neighborhood is one of the best areas of Malaga. There you can find everything: bars, restaurants, Fresh Market, supermarket, banks, pharmacies, shops, ... from there you can walk or bus everywhere. House Rules Frenta a la playa Malaga-Antonio Machado takes special requests – add in the next step! Please inform Frenta a la playa Malaga-Antonio Machado of your expected arrival time in advance. You can use the Special Requests box when booking, or contact the property directly using the contact details in your confirmation. The Apt is situated on a very busy main road and l personally found it very noisy, but it didnt bother everyone. The shower in the en suite needs sorting out as it sprays straight across to the wall behind, so you had to hold the shower head to shower. The beach was pretty disgusting as it was covered in wet wipes. The property was tired. The location was too far out. The beach is near but dirty. There are few decent local restaurants and bars. The property is on a busy road and so the traffic is quite noisey. However, the apartment is still very good value for money. It was nice being able to sample spanish living.